In the past few weeks, it has been thoroughly exposed how the left-leaning news and opinions website The Wire has become the hub of lies, half-truths and innuendos. We now may have one more to add to the list of “gaffes” by the leftist propaganda website. The Central Board of Excise & Customs (CBEC), responsible for administering Indirect Taxes in India, operates under the Ministry of Finance, Government of India. In a rebuttal published late night yesterday, the CBEC slammed The Wire for a “factually and legally incorrect” news item. According to the Customs Act, the DRI has 90 days to file its appeal against the order of the adjudicating authority before the Customs, Excise and Service Tax Appellate Tribunal (CESTAT) in Mumbai. Till the morning of Monday, November 20, such an appeal had not been filed. The last date for filing the appeal is Tuesday, November 21.
b. 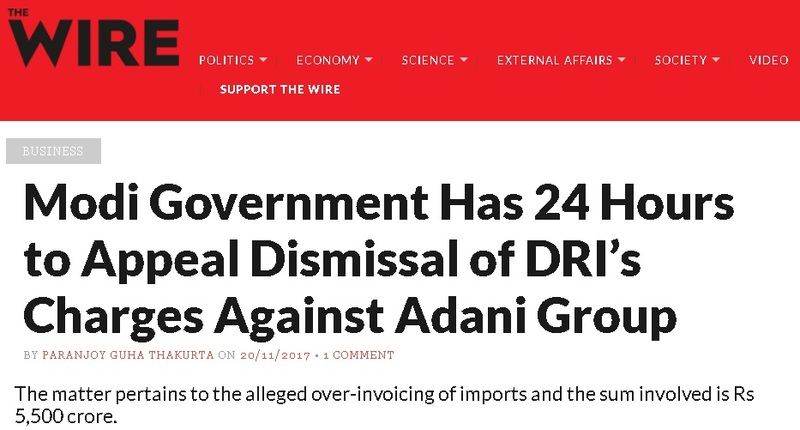 Contrary to the innuendos made in the piece, the Government is going to file an appeal against Adani, by the above date. The CBEC also asks The Wire to publish the rebuttal as soon as possible, in order to prevent misinformation from being spread. But will The Wire oblige? At the time of publishing this article, they had not published the rebuttal.